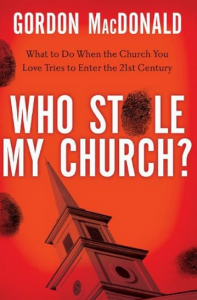 The sub-title is, “What to do when the church I love tries to enter the twenty-first century.” Though you may think this book is defending the traditional church in the face of contemporary changes, it is not. It is rather defending the contemporary church by making a caricature of conservative churches. MacDonald creates a hypothetical situation of a church (himself as pastor) that began to make changes but found opposition among its members, especially the older folks. He then meets regularly with them to explain why the changes need to happen. The chapters of the book basically record the ongoing sessions. The characters of the book represent typical scenarios of both conservative (slow, belligerent, stuffy) and contemporary (quick, witty, bright) people from MacDonald’s world. In the end, he easily convinces the naysayers because of their (typical) ignorance and his (typical) logic and wonderful answers. If you can stand it beyond this (I barely could), you will also find a number of increasingly typical contemporary points. MacDonald says the church has always been “contemporary” and innovative, looking for new ways to change and reach its generation. He even uses the Reformers (and Wesley) as examples (I would rather argue that such men called the church back to the basics of the Scripture). MacDonald believes that the church is stuck in a modernistic way of thinking rather than progressing into the postmodern age. He doesn’t think our generation of young people can understand our language, nor do they want to. He believes that soul-winning and invitations do not work because people in America are now like pagans on a mission field and therefore we must present everything slowly over time. Interpretive problems abound in the book. So does my lack of enthusiasm.